In its manifesto, the ruling party made slew of promises to people including construction of Ram Mandir, housing for all by 2020, doubling of farmers’ income by next year. 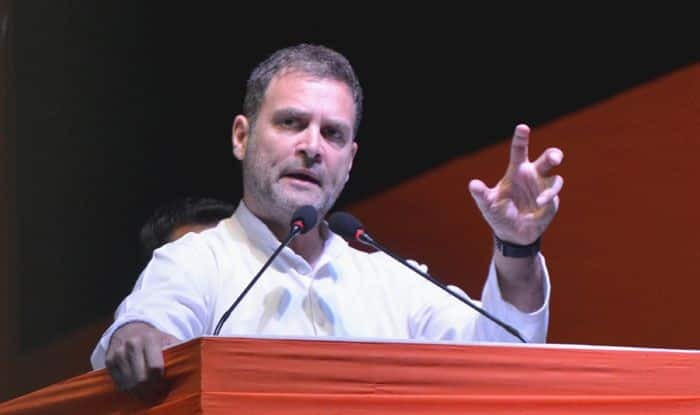 New Delhi: Congress president Rahul Gandhi on Monday criticised Bharatiya Janata Party‘s (BJP) ‘Sankalp Patra’ (manifesto) for Lok Sabha Elections 2019, calling it ‘short sighted and arrogant’. Referring it (manifesto) as the ‘voice of an isolated man’, Gandhi claimed that BJP’s ‘Sankalp Patra was created in a closed room. “The Congress manifesto was created through discussion. The voice of over a million Indian people it is wise and powerful. The BJP Manifesto was created in a closed room. The voice of an isolated man, it is short sighted and arrogant,” Gandhi tweeted. Earlier on Monday Prime Minister Narendra Modi, BJP chief Amit Shah had released party’s 45-page manifesto titled “Sankalp Patra”. Drafted on the theme of a ‘Sankalpit Bharat – Shashakt Bharat’ (determined India, empowered India), the ruling party’s ‘Sankalp Patra‘ makes 75 promises to woo different sections of the society, particularly farmers, youth and women, besides the oppressed. Titled ‘Hum Nibhayenge’ or ‘Will Deliver’, the 53-page manifesto of Congress party has promised to omit, amend certain laws, rules and regulation including Armed Forces (Special Powers) Act and section 124A of Indian Penal Code, that defines sedition. It also pledged to give good governance, freedom from indebtedness to farmers, protecting existing jobs while creating new ones and implementing anti-corruption laws without bias.